The particle size is so small that nothing can be observed under an electron microscope! Ionic silver is a solution consisting of water and single atom silver ions (dissolved silver) and contains no silver particles. Ionic silver is conductive and the electrical conductivity is directly related to the ionic concentration. The ions in solution remain dispersed due to mutual repulsion created by the ionic charge. What Doctors are saying about Colloidal Silver? Dr. Harry Margraf, a biochemist and pioneering silver researcher who worked with the late Carl Moyer, M.D., chairman of Washington University's Department of Surgery in the 1970s: "Silver is the best all-around germ fighter we have." Science Digest cites colloidal silver as "...a wonder of modern medicine," and further states"Antibiotics kill perhaps a half dozen different disease organisms, but silver kills some 650. Resistant strains fail to develop. Moreover, silver is non-toxic. Colloidal silver, used as an anti-microbial agent, will not create super bugs as antibiotics do." Larry C. Ford, M.D. of the Department of Obstetrics and Gynecology, UCLA School of Medicine, Centre For The Health Sciences reported in November 1, 1988, In laboratory tests with colloidal silver, bacteria, viruses, and fungal organisms are killed within minutes of contact." I tested them (the silver solutions) using standard anti-microbial tests for disinfectants. The silver solutions were anti-bacterial for concentrations of 105 organisms per ml of Streptococcus Pyogenes, Staphylococcus Aureus, Neisseria Gonorrhea, Gardnerella Vaginalis, Salmonella Typhi and other enteric pathogens, and fungicidal for Candida Albicans, Candida Globata and M. Furfur." Dr. Robert O. Becker, MD, noted biomedical researcher from Syracuse University, and author of The Body Electric and Cross Currents, recognized a correlation between low silver levels and sickness. He said silver deficiency is responsible for the improper functioning of the immune system. “What we have done is rediscover the fact that silver killed bacteria, which had been known for centuries.” In the process of his work, Dr. Becker discovered that he had wiped out types of bacteria across the board, even those that were resistant to antibiotics." Regarding the innate ability of metallic silver to control infection, Dr. Becker said: "all of the organisms that we tested were sensitive to the electrically generated silver ion, including some that were resistant to all known antibiotics." On the safety of silver, he said, "in no case were any undesirable side effects of the silver treatment apparent." Dr. Bart Flick of Argentum Medical LLC, another early pioneer in silver medical research, invented FDA approved Silverlon wound contact dressing. "The antimicrobial activity of silver rests upon the interaction of silver with the bacteria's cellular membrane. This interaction can occur through the presence of a silver ion in solution or the release of silver in an ionic moiety directly from the surface of metallic silver when a bacterial cell membrane comes in direct contact with the metallic surface." 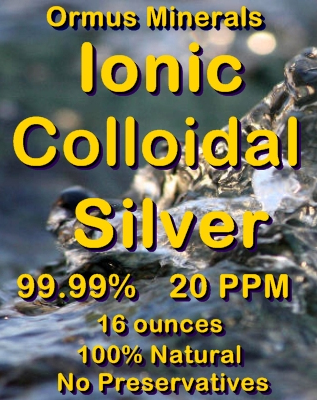 Dr. Henry Crooks, author of Use of Colloids in Health Disease, found that silver in the colloidal state is highly germicidal, quite harmless to humans and absolutely non-toxic. From his bacteriological experiments with silver he concluded, "I know of no microbe that is not killed in laboratory experiments in six minutes." Dr. Richard L. Davies, executive director of the Silver Institute, which monitors silver technology in 37 countries, reports: "In four years we've described 87 important new medical uses for silver. We're just beginning to see to what extent silver can relieve suffering." Peter Lindemann reports in his 1997 article, Colloidal Silver, A Closer Look, that a study conducted in part by the Institute of Microbiology in Rome, Italy and published in Applied and Environmental Microbiology (Dec. 1992), stated that "Pure electro-colloidal silver out- performed silver nitrate, silver chloride, and silver sulfadiazine as a broad spectrum germicide. For all classes of bacteria, fungus, and mold samples tested, pure electro-colloidal silver worked better, and at much lower concentrations. They concluded that any additives reduced the effectiveness of the pure silver ion." "[silver colloid nanoparticles] showed high antimicrobial and bactericidal activity ... including highly multiresistant strains ... A very low concentration of silver (as low as 1.69 mug/mL Ag) gave antibacterial performance. "